Thousands of locals cross it every day on their way home from work. Tourists visit it as suggested by the Seoul Tourism Organisation as a skypark, a sustainable traffic solution for the city. Yet more than that, one may see culture, lifestyle and even history from Seoullo 7017. 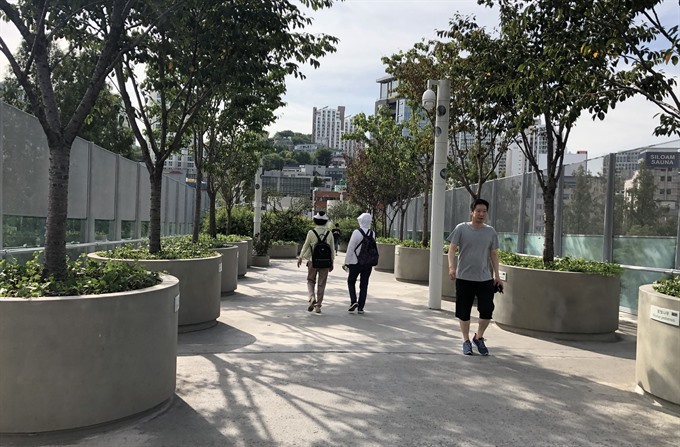 Located in the middle of bustling Seoul, the elevated, linear park was built above a former highway overpass closed in 2015, which stands at 17m above street level. The 1km path lined by thousands of plants was based on New York City’s High Line. It begins at Malli-dong and continues northeast past Seoul Station near Namdemun at Hoehyeon Station to ease traffic on normal routes. Historic documents say that under the Joseon Dynasty, all people and goods that entered the city had used gates between the city walls. Sungnyemun Gate was a main gate among them. The Hangangcheolgyo railroad was opened in 1900, connecting Noryangjin and the downtown. In 1970, traffic jams became worse due to the increasing numbers of vehicles. Overpasses were built all over the city, including the Seoul Station Overpass. The old overpass turned skygarden was designed by MVRDV, a Dutch firm, and opened in May 2017. The pathway affords a view of the traffic below and walking on the path and shade from the trees, plants and flowers, as well as a video exhibition. There are also foot massage machines installed for passers-by to relax. 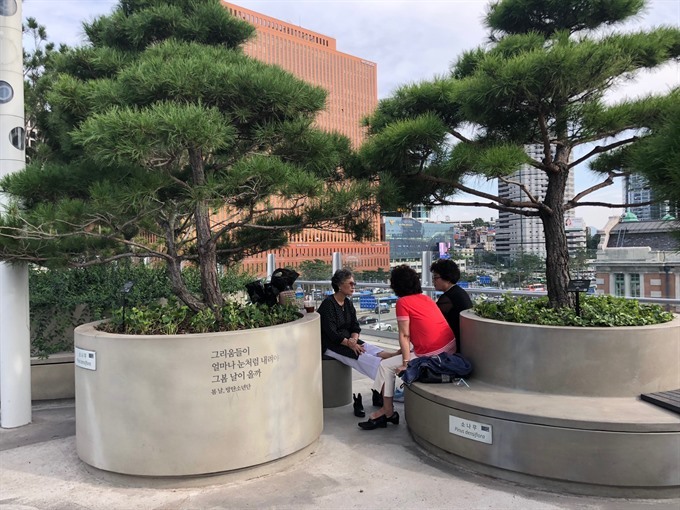 "The park will feature over 24,085 plants representing 228 species of trees, shrubs and flowers found in and outside Korea,” Kim said. “In the future, the park may become an urban nursery, growing trees and plants for replanting elsewhere in the city,” she said. 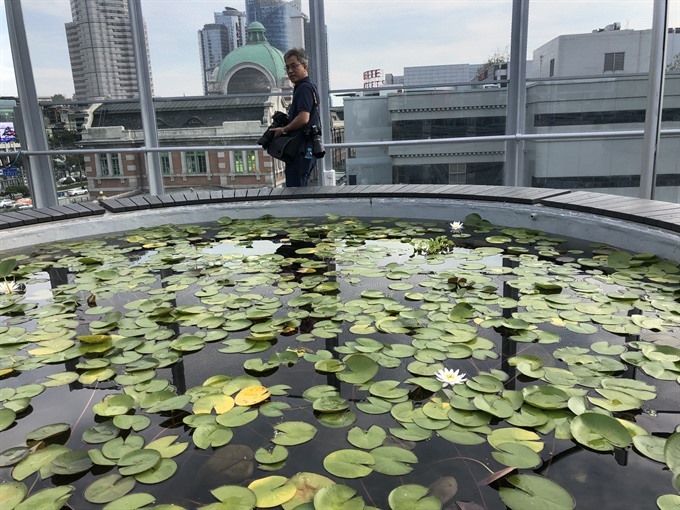 Retiree Kwangsu Than also meets his friend on the skygarden. 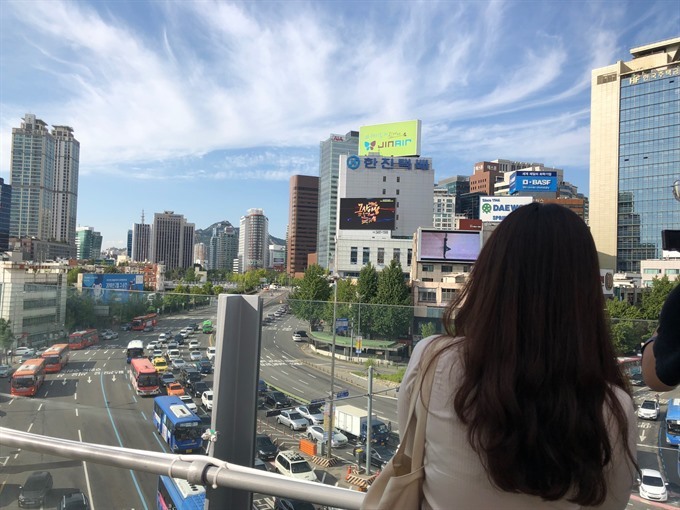 From Seoullo 7017’s exits, the city’s tourism organisation has designed walking tours with guides in Korean, English, Chinese and Japanese at 10am and 2pm everyday and a night view tour from May to October. 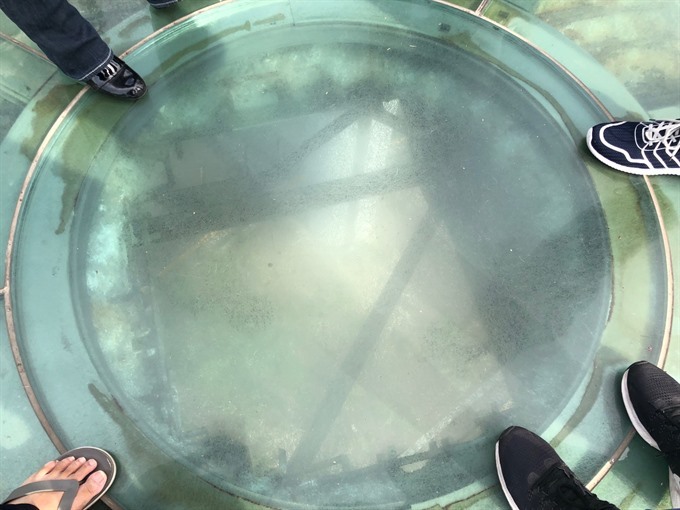 The tour lasts for around two hours to six main tourist attractions: Seoul Station, Sungnyemun Gate, Yakhyeon Catholic Church, Son Kee Chung Sports Park, Yeomcheongyo Handmade Shoes Street, and Hanyangdoseong (the Seoul City Wall). “The Gyeongseong station was built in 1925 and has been used as a train station since the liberation until 2004,” Kim said. “Now it is designated an historic site and used as a cultural space that hosts exhibition and art performances,” she said. “Sungnyemun Gate was built in 1396, when the Joseon Dynasty began, and is the oldest wooden building in Seoul,” according to the city’s tourism department. Yeomcheongyo Handmade Shoes Street is an interesting place to visit as it was the first in South Korea, Kim said. “After liberation, the military boots of American soldiers were reused to make men’s shoes,” she said. On the old street, you can still find the handicraft thriving in a modern industrial city.